SHIMIZU S-PULSE: vs URAWA RED DIAMONDS (August, 27th, 2017) Live Coverage! 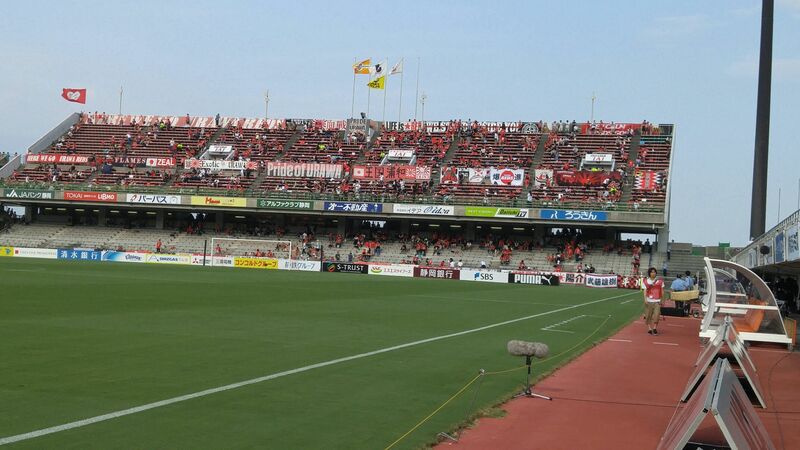 The notorious Urawa fans have been asked to stay in definite seats! 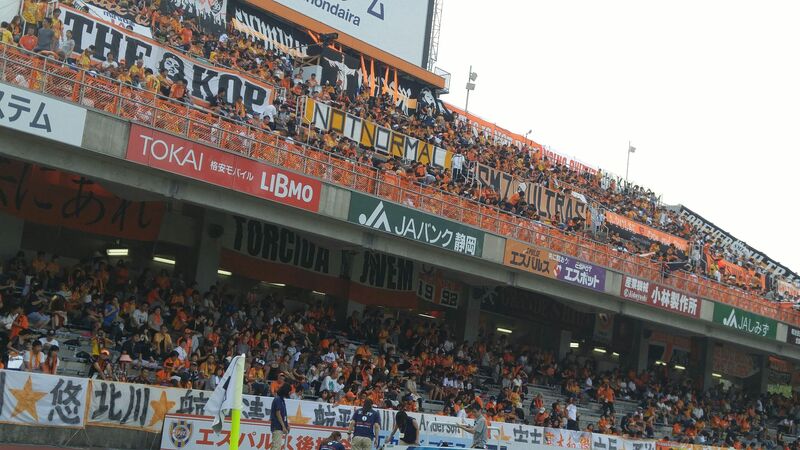 Consequently the Shimizu S-Pulse are louder than usual! 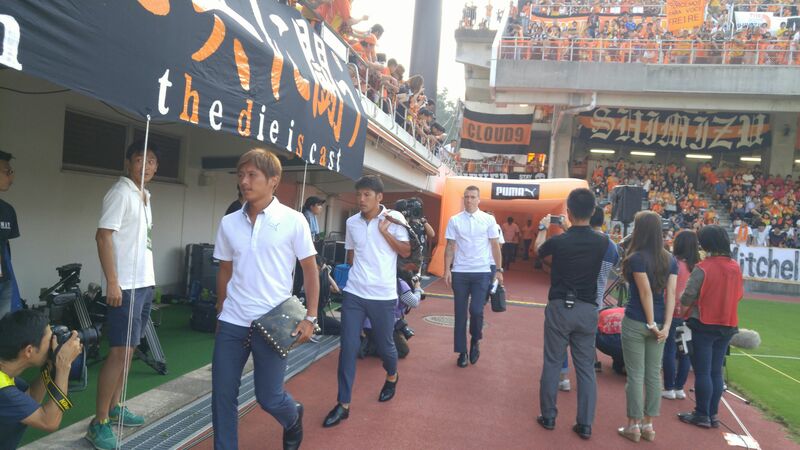 Stay with us with the live report of the J1 League game (Game 24, return match) played in Nihondaira Stadium in Shimizu Ku, Shizuoka City between Shimizu S-Pulse and one of the top teams in the J1 League, Urawa Red Diamonds! After two indiferrent prestations against Kashiwa Reysol at home and Kashima Antlers away Shimizu S-Pulse will be keen to achieve a favorable result for more serenity during the end of the season! 0′ Kick off by Urawa. 1′ Free kick for Urawa 25 meters away from right. Inconclusive. 2′ first shot at goal by S-Pulse from just outside the box. Safely caught by Urawa keeper. 5′ Both teams playing attacking football for the moment. 7′ Very dangerous chance for Urawa stopped by a foul just outside the box. Yellow card! Very dangerous free kick just in front of goal! Blocked! Shot wide over the bar by Urawa! 12′ Urawa dominating a febrile S-Pulse. 13′ Overconfident shot flying away by Urawa. 14′ S-Pulse on the defensive. 17′ Another free kick and again a yellow card against S-Pulse. Free kick from very left corner of the box! 19′ two very dangerous center kicks in succession by S-Pulse! 23′ S-Pulse getting dangerous. Mitchell Duke shoots wide. 25′ Poor shot wide over the bar by Urawa. 29′ Mitchell Duke earns a corner kick for S-Pulse. Kakuta catches the indecisive Urawa defense with a heading that takes ages to get in! 36′ Lull after a lot of excitement! 42′ S-Pulse very lucky here with a clear chance for Urawa being wasted again! Urawa wasted a lot of good possession and earned clear chances at goal but none was on target whereas S-Pulse had 2 and one converted. For once S-Pulse showed more realism but they gave a bit too much freedom to Urawa in midfield. Let’s hope they can improve on that! 45′ 2nd half kick off by S-Pulse. 45′ Urawa surrenders ball in midfield and Duke’s center floats dangerously across the goal! 46′ S-Pulse defense playing with fir! 47′ Goal for Urawa disallowed for off side. Stupid yellow card fornS-Pulse’S Hasegawa! 56′ Both teams making simple mistakes. 58′ a solo efforts almost ended into a goal by Matsubara who shoots into the side net! S-Pulse defense leaving too much freedom to Urawa who finally converts from short range through Endo! 68′ Weak longe rang shoot by S-Pulse easily caught by keeper. S-Pulse defens caught off guard again and low shoot just rolls past left post! Kitagawa in for Hasegawa for s-Pulse. Febrile S-Pulse defense gives a free shot to Rafael Silva who makes no mistake! All dangerous actions by Urawa come from the left side! Shirazaki in for Edamura for S-Pulse. 72′ Dangerous free kick for S-Pulse but kick just outside! 74′ S-Pulse forced to take risks! Urawa playing cat and mouse with s-Pulse! 86′ S-Pulse chasing shadows and wasting a clear cut chance when they finally grab the ball! 88′ Corner kick for Urawa. 89′ S-pulse completely out of it and Silva almost scores again for Urawa! Urawa deserve their win but they were helped in so-doing by S-Pulse who completely lost the plot in the second thinking they could defend a lone goal and thus surrendering their midfield in a simplistic strategy. The year still promises to be a long one especially with so many strikers injured.